As a followup to my post in Jokes called Old Salt. Have just returned from purchasing some ‘old salt’ from the local supermarket. My Woolies pink Himalayan salt 25/10/2018. Pink Himalayan salt is mostly mined at the Khewra Salt Mine in the Punjab province of Pakistan. The mine is a part of a salt range that originated about 800 million years ago, when evaporation of a shallow sea followed by geological movement formed a salt range that stretched for about 300 kilometres. The salt is coloured by a common pink microorganism that had lived in it. The salt reserves at Khewra were discovered when Alexander the Great crossed the Jhelum and Mianwali region during his Indian campaign in 320 BC. The mine was discovered, however, not by Alexander, nor by his allies, but by his army’s horses, when they were found licking the stones. Ailing horses of his army also recovered after licking the rock salt stones. After 800 million years and the discovery by Alexander the Great’s horses 2338 years ago, the expiry date on my Woolies salt is 07/2020. Only two years to go now … so funny LOL. At first your post was thought provoking, then it was thought provoking, and strangely, now, it is still thought provoking. In between thoughts, the funny side of it intrudes. Seriously though, I guess it is exposure to our murky atmosphere that limits its useful life? But salt is sturdy stuff. I doubt it will ‘degrade’ really. If you had some 800 million year old food to sprinkle it on, that would really be something? Nothing thought provoking on my part WTB, just a funny/ironic look at modern systems/requirements stuff that make the original intent look totally silly on occasion. Thought provoking for me. Must be the way I think. I thought back to those primal seas, of the life that existed at that time, of upheavals in the earth’s crust and the micro-organisms that bequeathed their colour to the salt that formed by evaporation. All those processes, and more, were active at that time. When the salt is mined now, it is like digging up a very old time capsule. 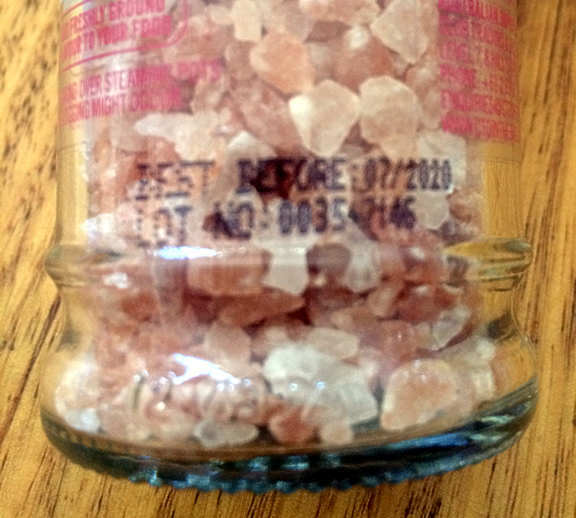 But I am mindful also of the apparent absurdity of 800 million year old salt being given a year to live. A bit of everything in there Jen. Just my way of looking at it. Good on you Williamthebold. Thanks for your interest and insights. The Eye surgeon & his team now travel to Camps where the people are Blind also too poor, to even pay the bus fare to Kathmandu for treatment, are now treated free. My recollections are from memory, having read the non fiction book, so my apologies, for having left anything important out. However Jen,it was your very interesting account of the Himalayan salt(which I used to wonder about when I would see the Salt in Woollies) which brought all this to my mind, thank you! Thanks Tulip. What an interesting story. Such dedicated people, all of them. The Old Salt certainly does provoke some interesting thoughts. Jen, WTB, and Tulip. Thanks for a great topic. 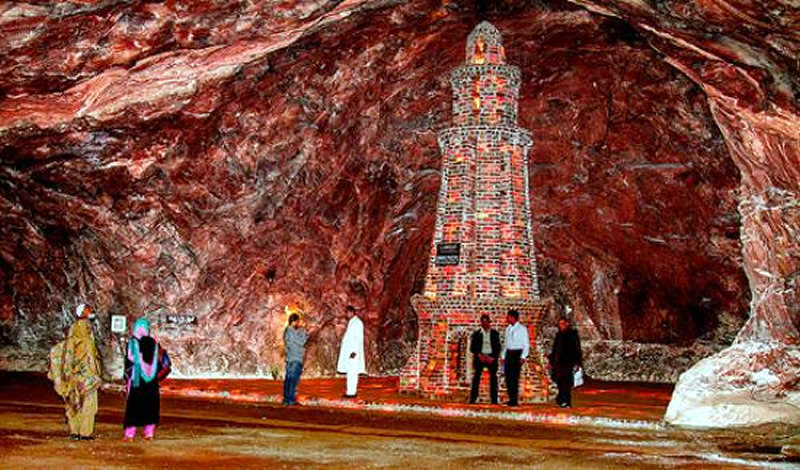 The Khewra Salt Mine is very famous I’ve found. It is Pakistan’s largest, the world’s 2nd largest and the oldest salt mine in the world and a major tourist attraction, drawing up to 250,000 visitors a year. 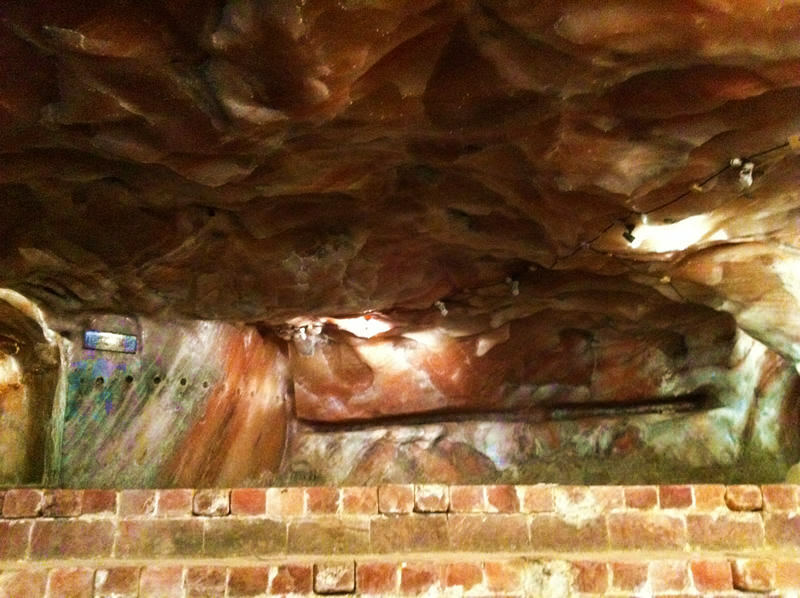 The rock salt makes for some beautiful textures on the walls and ceiling. A salt tower structure inside the mine.